An investment cooperation agreement with Jiangsu Province was signed on Monday to strengthen economic ties and build investment projects through joint opportunities for both the UAE and Chinese economies. The cooperation agreement was signed by H.E. 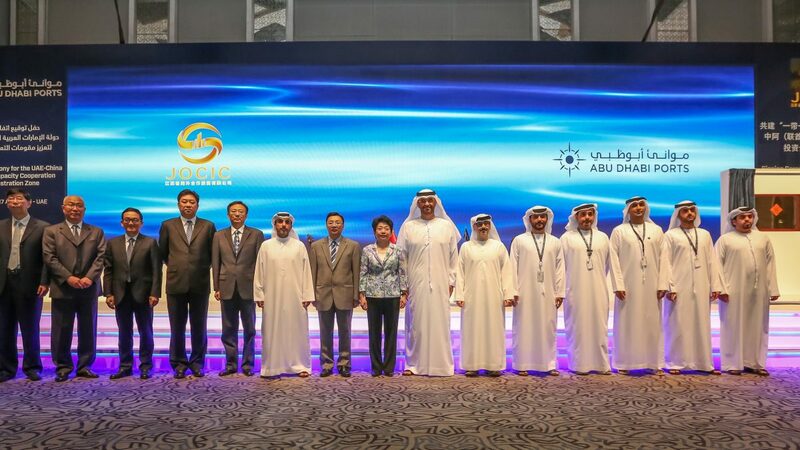 Dr. Sultan Ahmed Al Jaber, Minister of State and Chairman of Abu Dhabi Ports and Madame Huang Lixin, Executive Vice Governor of Jiangsu Provincial People’s Government, in addition to officials from both sides. In line with this strategic agreement, the ceremony also saw the establishment of a 50-year Musataha Agreement, signed by Abu Dhabi Ports with the Jiangsu Provincial Overseas Cooperation and Investment Company Limited (JOCIC), in Khalifa Port Free Trade Zone (KPFTZ). Captain Mohamed Juma Al Shamisi, CEO of Abu Dhabi Ports, Peng Xiangfeng, President of China Jiangsu International E.T.C.G and Luo Hua, General Manager of Jiangsu Province Overseas Cooperation and Investment Company Ltd. were the signatories of the lease agreement. Under the terms of the agreement, China-UAE Industrial Capacity Cooperation (Jiangsu) Construction Management Co., Ltd., a UAE company newly established by JOCIC, will occupy and develop approximately 23.7 million square feet of the free trade zone for companies from the Chinese province of Jiangsu. This represents 2.2% of the available free zone space in KIZAD’s newly allotted KPFTZ area. In addition to the signing ceremony, representatives from five Chinese tenant companies announced their plans to invest in the lease space, including Hanergy Thin Film Power Group, Jiangsu Fantai Mining Development (Group) Co. Ltd., Xuzhou Jianghe Wood Co. Ltd., Jiangsu Jinzi Environmental Technology Co. Ltd., and Guangzheng Group. The five companies signed with JOCIC as the frontrunners in taking advantage of the agreement’s highly competitive trade benefits. Combined, the new tenants will inject over a billion dirhams into KPFTZ, creating over 1,400 jobs, broadening the financial and physical scope of the zone while bolstering its ties to the “Belt and Road” initiative. H.E. Dr. Sultan reaffirmed that today’s historic signing agreement between the government of Abu Dhabi and the Chinese Province of Jiangsu marks a new step in partnership – to strengthen the close ties between the UAE and the People’s Republic of China. “The Musataha agreement between Abu Dhabi Ports and JOCIC will attract foreign investment into Abu Dhabi – an ideal environment for investment opportunities due to the competitive advantages Khalifa Port Free Trade Zone enjoys, including its strategic location, world-class infrastructure and logistics solutions. Khalifa Industrial Zone and Khalifa Port will become magnets of increasing investment due to the UAE’s strategic location at the pivot point between Asia, Europe and Africa,” H.E. Al Jaber added. Since the visit of H.H. Sheikh Mohammed bin Zayed Al-Nahyan, Crown Prince of Abu Dhabi and Deputy Supreme Commander of the UAE Armed Forces, to China in 2015, the relationship between the two countries has strengthened in a number of areas, most notably in economic and trade relations. In particular the UAE has committed to playing a key role in the development of the ‘Belt and Road’ and ‘Maritime Silk Road’ initiatives, which will foster economic growth. China is the UAE’s second largest trading partner and the biggest exporter to the UAE. The UAE is considered a gateway to about 60% of China’s exports to regional markets at an annual volume of exchange of 70 billion dollars. The UAE is also emerging as a logistical hub enabling trade connectivity between Asia and emerging markets in Africa. Commenting on the signing ceremony and the future of trade between the UAE and China was H.E Vice Governor Huang Lixin who stated that, “Jiangsu and Abu Dhabi are highly complementary to each other in terms of natural endowment, economic structure and industrial systems, bearing the common wishes to speed up industrial structural adjustment and promote economic transformation and upgrading. It is good timing for us to jointly deepen industrial capacity cooperation and promote the ‘Belt and Road’ Initiative, and we will have a broad prospect in this undertaking. We will work together with Abu Dhabi to build the UAE-China Industrial Capacity Cooperation Demonstration Zone into a landmark program of the ‘Belt and Road’ initiative and a beacon of UAE-China exchanges and cooperation”. Captain Mohamed Juma Al Shamisi said: “The Musataha agreement between Abu Dhabi Ports and JOCIC is one of the largest-ever lease agreements for KIZAD to date. This investment will drive trade relations with Jiangsu and accelerate investment in industrial assets in Abu Dhabi”. Building on the success of China’s “Belt and Road” and Maritime Silk Road initiatives, the agreement highlights the opportunities available to both Abu Dhabi and the UAE as regional economic integration deepens and trade ties expand across Asia. “Last year, Abu Dhabi Ports signed with COSCO Shipping Limited, the world’s largest container operator, who chose Khalifa Port as the hub for its operations in the Middle East, and is expected to raise the annual capacity to 6 million TEUs in both its existing container terminals. This marks a significant leap in the expansion of the Port, transfer of goods and reduction of costs. In addition to attracting investors from Eastern Asia, it will increase Khalifa Ports’ competitiveness and ease the way for more partnerships with companies and friends in China and East Asia, which will draw further investments into Abu Dhabi,” said Al Shamisi. The lease promises to start a long-term, beneficial relationship between the two entities. It also includes the option for China-UAE Industrial Capacity Cooperation (Jiangsu) Construction Management Co., Ltd. to establish and develop a further 107,639,100 square feet of free zone at KIZAD Area B to meet additional demand by Jiangsu province businesses. Today’s announcement is part of a string of recent investments and partnerships between the two countries that follow the establishment of the $10 billion joint investment fund established in 2015, UAE-China Joint Investment Fund, as part of Beijing’s drive to forge closer commercial and political ties with the Middle East and build new trade routes between East and West.